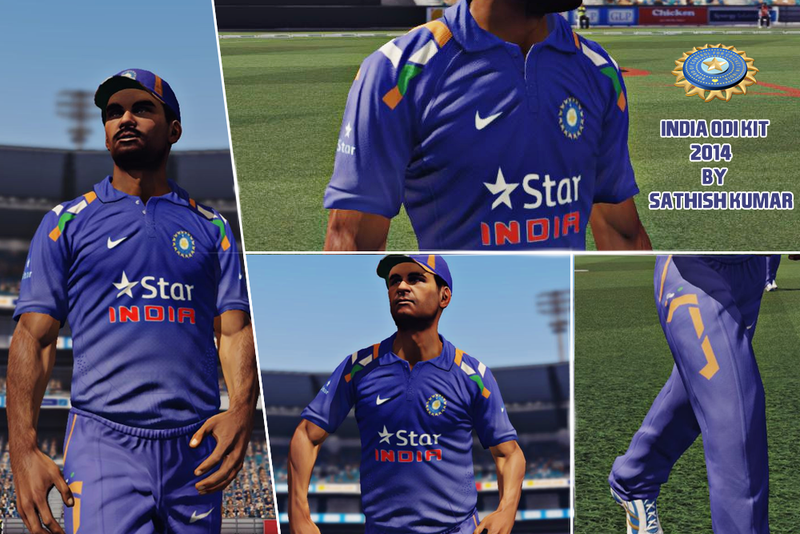 India ODI Kit 2014 for Don Bradman Cricket 14 Patch DBC14. A2 Studios releases first ever patch for Don Bradman Cricket 14 game DBC 14. The High quality kit is delight to watch in the game. You will definitely enjoy this release. The download link and installation guide is given below. If you find any difficulty in installation, tell us in comment box below! 1. Extract the textures folder to "Documents\My Games\Don Bradman Cricket 14\"
2. Launch the Game and go to Don Bradman Cricket Academy, select "Team Manager" and go to "India (Current Generation)"
3. Select "Identity" and make sure you have the team sponsor set to "Score"
i) Set the Top Model to "Current" and pattern to 7.
ii) Set the Pants Model to "Current" and pattern to 7. 6. Also,modify the shirt number , cap and helmet colors. Thats all! You're Done.